TSWREIS Online application form for Selection of Lecturers, Degree Colleges Lecturers recruitment 2018, Lecturers recruitment written exam date, Selection Procedure, Exam pattern, Question Paper Model, Exam Fee, eligibility criteria and TSW Residential Degree College for Women Lecturers Recruitment Exam Application form & Instructions are given here : TSWRIES published the Degree Lecturers Recruitment 2018 notification and applications are invited from the eligible WOMEN candidates/Male Candidates for utilizing their services as Faculty members to handle English Medium classes in the subjects of 1) Telugu 2) English 3) History 4) Economics 5) Political Science 6) Mathematics 7) Physics 8) Chemistry 9) Statistics 10) Computer Science 11) Botany 12) Zoology 13) Micro Biology 14) Commerce in the TSW Residential Degree Colleges for women to be established during the academic year 2018-18. Instructions to the candidates applying for guest faculty positions in TSW Residential Degree colleges for women given below. 1. Retired Junior Lecturers in Junior Colleges and Lecturers in Degree Colleges both men and women are eligible to apply. 2. Candidates belonging to Zone-V and Zone-VI are alone eligible to apply. 3. A Masters Degree (i.e., M.A / M.Sc / M.Com) with a minimum of 55% of marks in the relevant Subject is required. M.C.A / M.Sc Computers in case of Computer Science subject. Additional qualifications like Ph.D / NET / SLET / M.Phil. will be preferred. 4. Candidates with B.Tech qualifications with 60% of marks possessing exceptional abilities shall also be considered to engage classes in certain subjects like Computers, Maths, Physics, Chemistry and Statistics. The services of the selected candidates will be utilized purely on out sourcing basis during this academic year. The remuneration payable is Rs.20,000/- to Rs.30,000/- per month depending on the work load in the subject concerned i.e., Number of periods to be engaged in a week by the selected candidates in the subject. 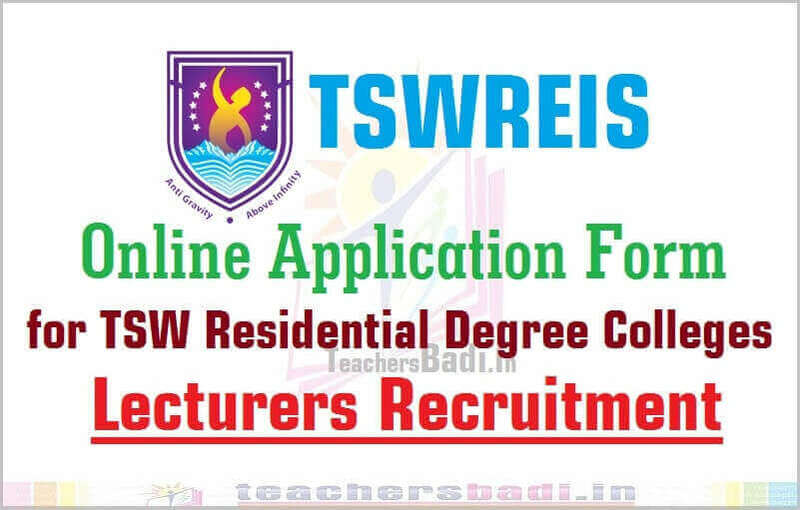 Interested Candidates have to apply online through www.tswreis.telangana.gov.in. i) Written Test to be conducted for a duration of 1 1/2 Hours. 2. Hall tickets can be downloaded from ..-04-2018. 3. The written test will be conducted ...........................-06-2018 by 2 pm to 3 pm p.m. in the Telangana Social Welfare Residential institutions in Hyderabad.